Puzzle ball. Just like the others. Plus one more that I made in the interim for our neighbor’s daughter, my birthday buddy (more on that later). So that brings the total up to four puzzle balls. Right now it’s bigger than his head, and his hands aren’t quite big enough to grab onto the wedges. But it was a nice two month birthday present nonetheless. It’s a simple equation. 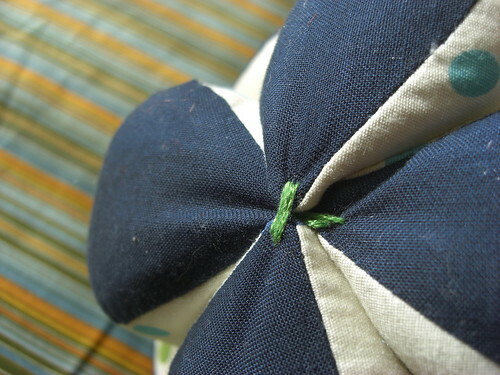 You sew (or knit, etc.) + you are pregnant = Lots of questions about what you’re going to make for the baby. Which is great and understandable and all, unless you don’t have grand plans to make lots of cute little adorable things for your child. Or there are other projects getting in the way of your grand plans. You know, like moving. Anyway, I sort of deflected. I made a couple of things for myself while I was pregnant. That's for the baby, right? But as for completed projects actually for the baby, there weren’t too many. Actually, just one two one and a half. Which I’ll get to cataloging sometime. And then something bit me. I’ve long been of the opinion that homemade baby clothes probably weren’t for me. They’re tiny and probably pretty fiddly, and I would probably get a fairly full closet from gifts. The exception I made? Special events. 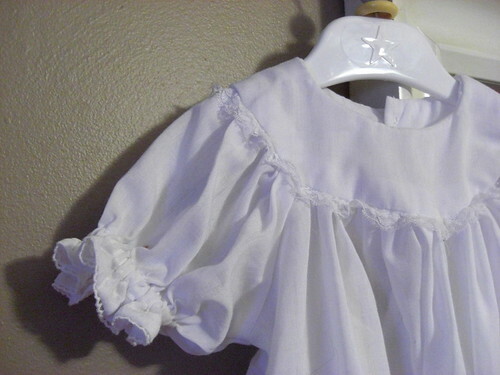 Birthday, Christmas, Easter, and the one that sent me to my sewing machine two weeks ago…Baptism. 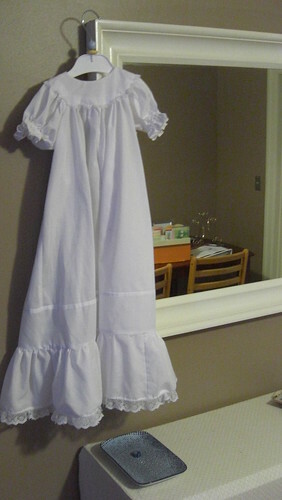 “But,” you say, “christening gowns are heirloom sewing. They take forever!” Which is true. And which is why I was glad I already had a jump start. Mom offered us the use of the gown my sister and I wore when we were baptized. Being a sucker for tradition and all that jazz, I jumped on it. But then I took a good look and decided I’d really be happier if there were a little less lace. So I took the lace out from around the neck and replaced the sleeve lace with another bit of trim which ended up looking like picot edging. 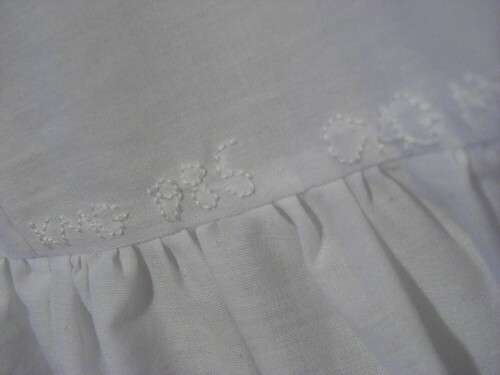 And then I added some embroidery with the initials and years that the gown has been used. Not the best embroidery job ever, but I decided it added charm. Since I was baptized in Ohio in the spring and my sister in Virginia in the summer, I knew I’d have to do something about keeping my boy warm. 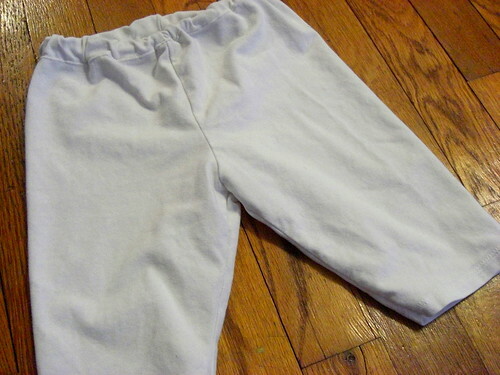 I pulled out the KwikSew Clothes for Baby book that my sister gave me for a shower present, traced off the pants, and went to my thrift store donation pile. Luckily, there was a white shirt which was just big enough to get the pants cut out. 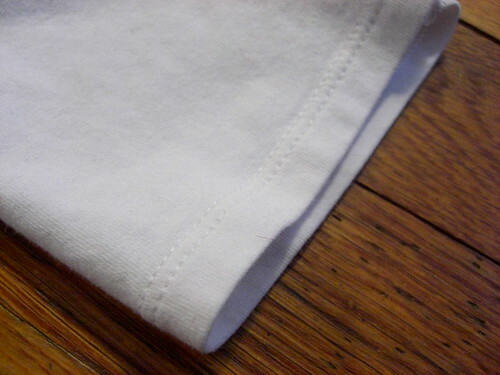 I used the hem of the t-shirt for the hem of the pants, so they were extra quick and easy--done in an evening while my sister-in-law entertained the baby. Plus the elastic was harvested from some fitted sheets we bought to make curtains for his room, so all-in-all, I felt quite thrifty. And my son, quite warm. And so here it is, a finished product! Clothes for my son! Prayer Answered, originally uploaded by prakhar. As always, a day late and a dollar short. But I've really been looking forward to getting back to this space, trying to find a balance between crafty posts and the rest of life. We'll see how that goes. I rang in 2011 in my bed. A cold descended upon our house just in time for this wonderful three day weekend, so I've been lying on the couch, watching 24 and feeding the baby. I have all kinds of Ideas! Goals! Aspirations! but I'll have to go about setting them down when situations are more amenable (i.e. not typing with the On-Screen Keyboard).